This article is about the post in England, Great Britain and the United Kingdom. For the corresponding post in Ireland, see Lord High Treasurer of Ireland. For the corresponding post in Scotland, see Lord High Treasurer of Scotland. For the corresponding post in Sweden, see Lord High Treasurer of Sweden. The Lord High Treasurer functions as the head of Her Majesty's Treasury. Since the 17th century, the office has often been held, not by a single person, but placed in commission, so that a board of individuals jointly exercise the powers of the Lord High Treasurer. Such persons are known as Lords Commissioners of the Treasury. The office has been in commission continuously since the resignation of Charles Talbot, 1st Duke of Shrewsbury in 1714. 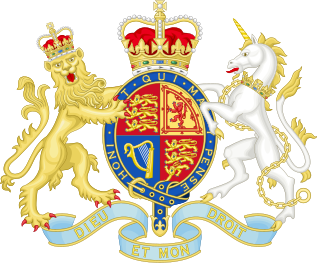 Although the United Kingdom of Great Britain and Ireland was created in 1801, it was not until the Consolidated Fund Act 1816 that the separate offices of Lord High Treasurer of Great Britain and Lord High Treasurer of Ireland were united into one office as the Lord High Treasurer of the United Kingdom of Great Britain and Ireland on 5 January 1817. The office continued in commission and the commissioners of the old office of Lord High Treasurer of Great Britain continued as the commissioners of the new combined office. In modern times, by convention, the Lords Commissioners of the Treasury include the Prime Minister of the United Kingdom, usually serving as the "First Lord of the Treasury", and the Chancellor of the Exchequer, serving as the "Second Lord of the Treasury". Other members of the government, usually whips in the House of Commons, are appointed to serve as the junior Lords Commissioners of the Treasury. The English Treasury seems to have come into existence around 1126, during the reign of Henry I, as the financial responsibilities were separated from the rest of the job that evolved into Lord Great Chamberlain. The Treasury was originally a section of the Royal Household with custody of the King's money. In 1216, a Treasurer was appointed to take control of the Treasury in Winchester. The Treasurer was also an officer of the Exchequer, and supervised the royal accounts. By Tudor times, the Lord High Treasurer had achieved a place among the Great Officers of State, behind the Lord Chancellor and above the Master of the Horse. Under the Treason Act 1351 it was treason to kill him. During the sixteenth century, the Lord High Treasurer was often considered the most important official of the government, and became a de facto Prime Minister. 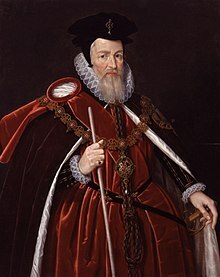 Exemplifying the power of the Lord High Treasurer is William Cecil, 1st Baron Burghley, who served in the post from 1572 to 1598. During his tenure, he dominated the administration under Elizabeth I. Since then a system has evolved which has hardly varied. Today, the First Lord of the Treasury is as a rule the Prime Minister, and the Second Lord of the Treasury is the Chancellor of the Exchequer, who has inherited most of the functional financial responsibilities. Next rank the "Junior Lords of the Treasury" who, though theoretically members of the Treasury Board, in practice serve as Government Whips under the Parliamentary Secretary to the Treasury (Chief Whip). Current commissioners consist of Prime Minister Theresa May and Philip Hammond; with junior lords as David Evennett MP, John Penrose MP, Mel Stride MP, Charlie Elphicke MP, George Hollingbery MP and Guto Bebb MP. Chisholm, Hugh, ed. (1911). "Lord High Treasurer" . Encyclopædia Britannica (11th ed.). Cambridge University Press. ^ a b "Consolidated Fund Act 1816". legislation.gov.uk. UK Government. p. Section 2. Retrieved 18 November 2016. ^ "Ministers". GOV.UK. Retrieved 24 January 2017. Her Majesty's Treasury, sometimes referred to as the Exchequer, or more informally the Treasury, is the British government department responsible for developing and executing the government's public finance policy and economic policy. The Treasury maintains the Online System for Central Accounting and Reporting (OSCAR), the replacement for the Combined Online Information System (COINS), which itemises departmental spending under thousands of category headings, and from which the Whole of Government Accounts (WGA) annual financial statements are produced. This article lists government ministers who served under Prime Minister Margaret Thatcher. Thatcher was Prime Minister of the United Kingdom from 1979 to 1990, during which time she led a Conservative government. She was the first woman to hold that office. During her premiership, Thatcher retained the Falkland Islands, moved to liberalise the British economy through deregulation, privatisation, introducing the Right to Buy, through lower taxation and the promotion of entrepreneurialism. Financial Secretary to the Treasury is a junior Ministerial post in the British Treasury. It is the fifth most significant ministerial role within the Treasury after the First Lord of the Treasury, the Chancellor of the Exchequer, the Chief Secretary to the Treasury, and the Paymaster General. It is almost never a Cabinet office. The Conservative government of the United Kingdom that began in 1922 and ended in 1924 consisted of two ministries: the Law ministry and then the first Baldwin ministry. The Shadow Cabinet appointed by Conservative Party leader William Hague was the Official Opposition Shadow Cabinet from 1997 to 2001. Following his initial appointments in June 1997, Hague reshuffled the Shadow Cabinet five times before his resignation as leader following defeat in the 2001 general election. The UK Shadow Cabinet was appointed by Conservative Party leader Iain Duncan Smith. Following his initial appointments in September 2001 Smith managed three reshuffles before his resignation as leader in November 2003. Gordon Brown formed the Brown ministry after being invited by Queen Elizabeth II to begin a new government following the resignation of the previous Prime Minister of the United Kingdom, Tony Blair, on 27 June 2007. He took office as Prime Minister, a title he would hold until his resignation on 11 May 2010. In his inaugural cabinet, Brown appointed the United Kingdom's first female Home Secretary, Jacqui Smith.